This recipe is sure to become one of your family's favorite holiday pies. It's perfect for a Thanksgiving dessert or a Christmas dessert. 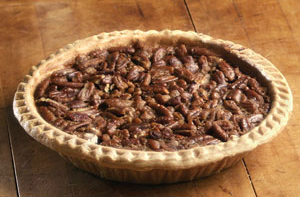 When I first had this pecan pie I couldn't stop eating it. It's the recipe from a real Louisiana Grandmother. Thanks to Carno for sharing. To roast pecans - pre heat oven to 350 degrees. Spread pecans evenly on baking sheet. Place into oven for 4 minutes. Remove from oven, stir and return to oven for additional 4-5 minutes. Let cool. You can chop them or leave them whole, or do a combination of both. Mix all ingredients well. Pour half each into pie pans. Spread pecans evenly over mixture. Cook pies at 350 degrees for 45-55 minutes.